I was asked to help a vegetable grower figure out what was going on with something wreaking havoc and eating his ripening sweet corn. Typically, when someone mentions sweet corn and problems, the first demon that comes to mind are those little masked, sweet-toothed bandits, known as raccoons! When I arrived out in the field, I was surprised to see the corn stalks standing tall in nice rows. The masked marauders climb up the cornstalk to the get to the ripest, uppermost ear of corn; consequently, the corn stalks are most often snapped off or pushed over down to the ground from the plump little pilferers! It wouldn’t be so bad if they would munch the whole ear of corn, but nooo way! They’ll take a couple of bites out of the ear, move on to the next sweet smelling corn stalk and the climb for corn continues through the night. 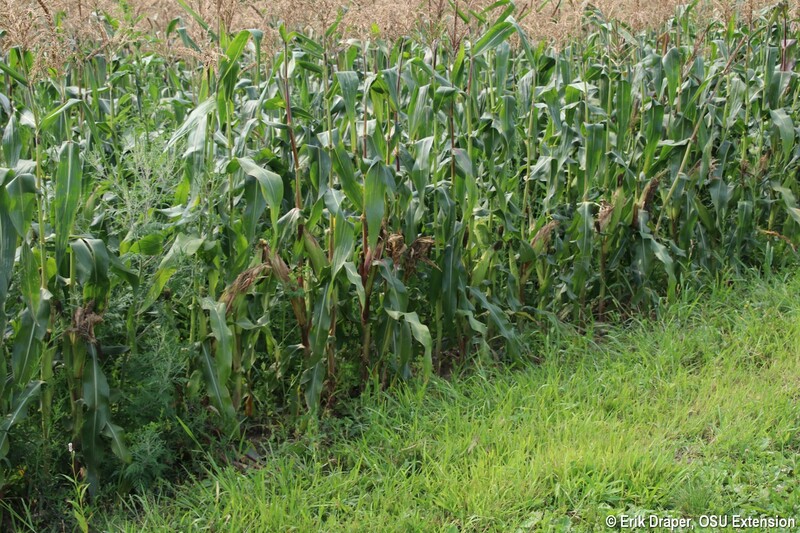 One hungry raccoon can damage numerous cornstalks and destroy 2-4 dozen ears of ripening sweet corn in a single night! I digress, so as I walked out into the field there wasn’t a single corn stalk tipped over and I thought, “what in the heck is the problem… the corn is all upright!” I then looked more closely at the actual ears of corn and saw the damage. It was consistently about 18 inches to 2 feet off the ground and not a single ear had been bent down or torn off or ripped open. The damage was more prevalent on the outside rows of sweet corn and was always on the side of the ear of corn and through the husks covering the ear. The damage began as an elliptical area or opening and progressed up the ear until the husks split open to reveal the upper part of the ear. Everything was neat and tidy and no half-munched kernels were on the ground or scattered around the base of the stalks. The damaged ear continued to dry out and secondary pathogens then began to invade the open wounds and ruin the entire ear of corn. Did you figure out the problem? It baffled me until I found some damage near a huge mud puddle that held some tracks, then it fit together and all made perfect sense. I can image that this culprit will be invited to dinner for this year's Thanksgiving day meal because it is already stuffed full with sweet corn!! Should be quite tasty!